We have reached a new era in Elton’s career. 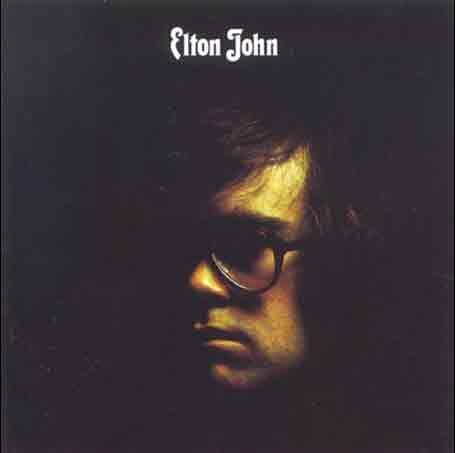 Even though we are less than one year removed from the Empty Sky era, the release of the Elton John album marked the true start of Elton’s extremely successful career. Of course, the lead track on the album is one of Elton’s most famous and well-loved compositions, Your Song. Your Song was released first as the b-side to the Take Me To the Pilot single in October of 1970 in the US. Disc jockeys much preferred Your Song to the a-side of the single so it wound up getting much more radio play and eventually went to #8 on the Billboard Hot 100 and #7 on the UK charts. It was also Elton’s famed performance at the Los Angeles Troubadour in August of 1970 that truly broke him in the states. Musically the song is a sensitive ballad with a blend of folk and jazz stylings. The song is written in the key of Eb, a key that Elton has used throughout his career many times. It is a great piano player’s key because it uses a nice blend of black and white keys lightening up the strain on the player’s fingers. The Elton John album also featured Elton’s first collaboration of many with arranger Paul Buckmaster and producer Gus Dudgeon. Buckmaster did the string arrangements on the album putting another signature on the Elton John sound. Your Song features strings throughout nearly the entire song. Lyrically, the song is an extremely naive love song, where the narrator often stumbles over the lines they are trying to get out. “If I was a sculptor, but then again no, or a man who makes potions in a traveling show.” Taupin has stated that the song was written over breakfast and the original copy of the lyrics was stained by spilt eggs. Personally, this song has a great deal of meaning for me. I remember when I first started listening to Elton John more than twelve years ago, I was at home with my mother quietly singing Your Song to myself. According to my interpretation of the lyrics, I sang, “anyway the thing is, what I really mean, your’s are the sweetest skies I’ve ever seen.” My mother said, “Tyler, I’m pretty sure the lyric says ‘yours are the sweetest eyes I’ve ever seen,’ not ‘skies. '” Of course she was right. In September of 2004, my mother suddenly passed away. 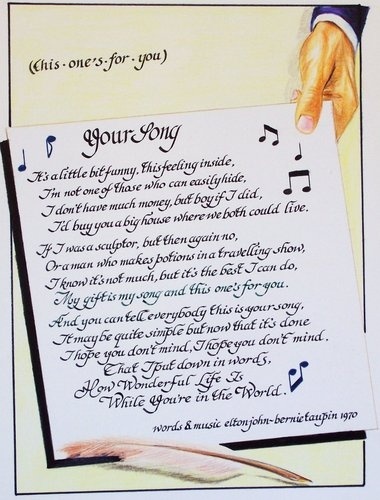 Whenever I hear Elton sing this line I think of my mother’s eyes, and I truly know what Bernie meant by saying, “your’s are the sweetest eyes I’ve ever seen.” Your Song is one of the many instances where Elton’s songs have truly helped me cope with what happens in life. So please enjoy my rendition of Your Song; this one is dedicated to my mother’s memory. The artwork above was done by Old76. Be sure to check out Old76’s flickr page for a bunch more fantastic Elton John artwork. What an absolutely beautiful description….just wonderful, and very touching. Your Song was the 1st EJ song I ever heard, back in the summer of 71…and even though I call many, many songs “favorites”, Your Song is #1 – BECAUSE it was the first one. Truly a very special song for millions! Thank you for highlighting it. I had a lot of fun singing this one to your piano and posting it as a video response. Hopefully you’ll keep going and we can do the whole catalogue together. How long do you think it’ll take?? It must be around 300 songs or so, right? I love the idea of going in chronological order…but I admit, I’m so anxious to get to Tumbleweed Connection. That’s my favorite album of his (except Love Song, which I don’t care much for, but that’s okay since he didn’t write it). Talking Old Soldiers is my favorite song to sing in the world. It’s an odd song to be a favorite, but it really is. Yeah I think it will take a unbelieveably LONG time. But its do-able. And I’m so reliant on sheet music that I wont be able to do everything. Talking Old Soldiers happens to be one of my absolute favorites as well. I should be there sometime in the near future. Looking forward to what you do with it! Great work so far. Thank-you for this. And God bless you and your mother. Love doesn’t die.